Plants perennial; cespitose, not rhizomatous. 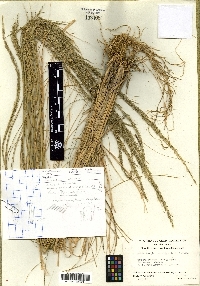 Culms 50-100 cm tall, 2-4 mm thick, erect, rounded near the base, not conspicuously branched, not rooting at the lower nodes; internodes mostly glabrous, sometimes puberulent below the nodes. Sheaths longer than the internodes, smooth or scabridulous, not becoming spirally coiled when old; ligules 1-3 mm, firm to membranous, truncate, ciliolate; blades 15-50 cm long, 1-3.5 mm wide, flat to involute, smooth or scabridulous abaxially, scabrous adaxially. Panicles 15-35 cm long, 0.5-2(3) cm wide; primary branches 0.5-8 cm, appressed; pedicels 1-6 mm, hispidulous. 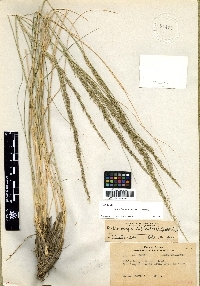 Spikelets 3-4.3 mm, yellowish-brown to purplish. 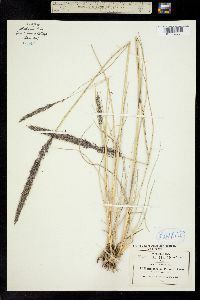 Glumes subequal, (1.7)2-3.1 mm, about 3/4 as long as the florets, scabridulous distally, 1-veined, apices acute to acuminate, awned, awns to 1.5 mm; lemmas 3-4.3 mm, lanceolate, calluses hairy, hairs to 1.5 mm, lemma bodies scabridulous, apices acuminate, awned, awns 3-10 mm, straight; paleas 2.9-4.2 mm, lanceolate, scabridulous, acute to acuminate; anthers 1.5-2.5 mm, yellow to purple-tinged. Caryopses 2-3 mm, fusiform, brownish. 2n = unknown. Muhlenbergia palmeri grows in rocky drainages and in sandy soil along creeks, at elevations of 1000-2100 m. Its range extends from southern Arizona into northern Mexico.